La Glroia Cubana is, as the name would lead you to believe, one of those businesses that was operating in Cuba once upon a time. They were making great cigars there, selling them to any and all who wanted them, and they could be enjoyed all around the world. 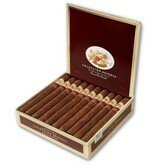 Then came the Cuban revolution, and the cigar world was turned upside down. The big brands were taken over by the Castro allies, and the small ones? They were done away with, destroyed, and the facilities were turned over to the government for their chosen brands. La Gloria Cubana went abroad, therefore, and began making their cigars elsewhere, in another nation, one where they could still enjoy the fruits of their labors. The Coleccion Reserva Presidente, then, is there to celebrate the fact that they had been making cigars for 25 years without interruption, and that means they put a bit of extra effort into these vitolas. Indeed, it was the first cigar that Ernesto Perez-Carrillo had blended in literally a decade, and he made the blend using proprietary tobaccos that had been sitting in his personal collection. So what makes this cigar so special? It begins with an oily Ecuadorian Sumatra wrapper, a dark and delicious way to begin any cigar. Add to that these amazing tobaccos blended together, and you have a cigar that you owe it to yourself to try. And since it is not likely to be something you will always be able to find, you are going to want to snap up a box while you can still find one at your local cigar shop or via your favorite online cigar site.